Jennifer Lin (second from left) gave an impromptu speech about her greatest life lesson in the Fall 2017 Toastmasters Table Topics contest in Division G.
While students were finally winding down from a week of midterms and preparing for their fall break adventures, members from the campus Toastmasters chapter were partaking in the Fall 2017 Toastmasters Humorous Speech and Table Topics Contest in Division G, which encompasses Sarasota and Manatee counties. 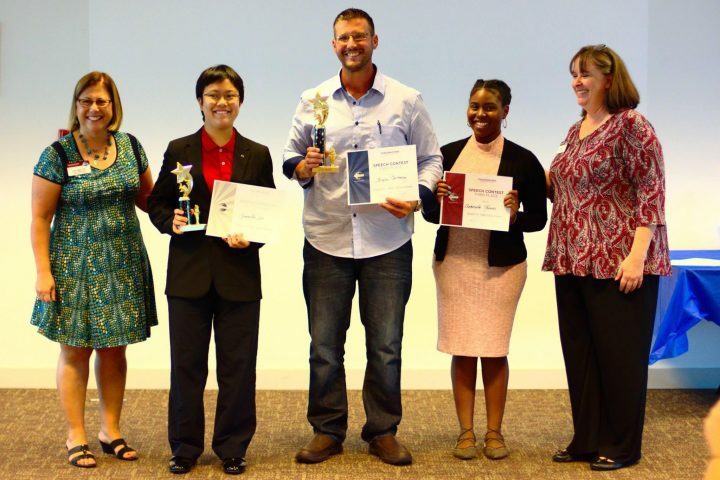 Second-year Jennifer Lin, President of the campus Toastmasters chapter and District Newsletter Editor for Toastmaster District 48, was awarded second-place in the table topics competition. Table Topics is a challenging impromptu speaking contest. Contestants are given a topic as they step onto stage, which they do not have prior knowledge of, and are asked to give a coherent one-to-two minute speech with only about 10 seconds of preparation. As Lin walked before an audience, she was told she had to speak to her greatest life lesson. 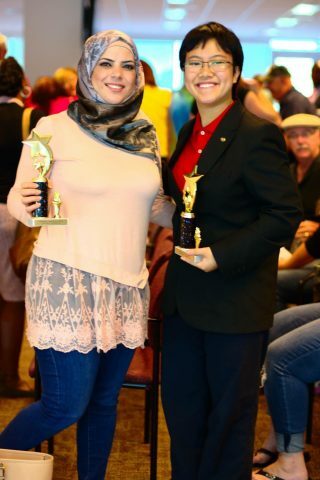 Jennifer Lin (right), second-year and founder of the Toastmasters club on campus, placed second place in the Fall 2017 Toastmasters Table Topics contest in Division G.
Lin founded the Toastmasters chapter at New College during the first semester of her first year to provide an environment for students to develop communication and leadership skills. The campus club is one of the 16,400 clubs around the globe dedicated to Toastmasters International’s mission: to empower individuals to become more effective communicators and leaders. Lin invites anyone interested in public speaking, leadership, communication and in having fun to stop by a meeting.